Preparing for the half year we cannot easily use the boat is plenty of work. This year, we fitted a heavy duty tarp over the boat from the mast aft. Maybe we'll fit a smaller tarp over the forward sections. What this all means is that we take a rectangular tarp from the hardware store and cut it to match the odd angles and curves of a yacht. 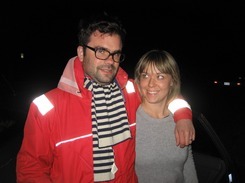 To add to the drama, the fitting session was a windy day. The end result is a winter cover that fits well. It is also a template for a more durable winter cover to be built later. 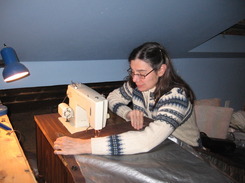 Elizabeth measured, cut, and sewed the tarp in our attic loft. It is a challenge to fit the fabric into the sewing machine. One thinks that E might like a canvass-making loft to appear in the basement some day soon? A new sewing machine, too? The real test is what it looks like after the first good snowfall. Is the cover going to stay put? The heavy snow will, we hope, slide off the steeply pitched roof and into the harbor. Other work we have completed in preparation for winter is to anti freeze the water system and de-salt the engine's raw water cooling system. Oil and filter changes next up. We keep the bottom scrubbed clean. Just in case we need to go for a sail. Inside the boat and cover is cozy. The stove and tea kettle remain, of course. How does one do winter work without a hot cuppa? 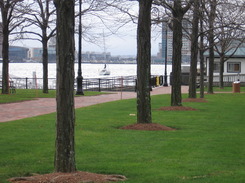 Piers Park is our summer home. Here is the view with bare trees after a couple of stormy days. The park is well cared for as evidenced by the green lawn and absence of leaves. 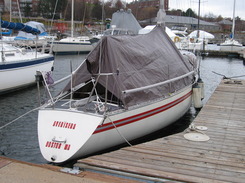 Winter sailing plans for Averisera is the New Years Day Race sponsored by the Constitution YC. Past years we have done the RC work. This year, the boat is ready to go racing. After dinner, the kids got up to play in the living room and the grownups sat at the table. Play for the grandsons involves a lot of drawing and coloring. TV is not much of a factor, happily for us. 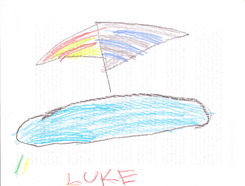 Below is art by Luke. Elizabeth asked him about the things he saw, what he remembered, etc. The lad dashed off and presented this. 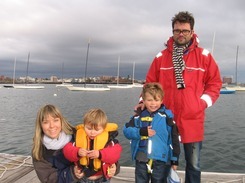 During our day on the water, we sailed in front of the Boston Sailing Center frostbite fleet as they came down the harbor with spinnakers flying. Luke must have taken it all in. Later, Elizabeth and Luke had a session at the piano. Of course, he demonstrated unusual skill at the instrument. Marc is quiet but he hears everything. A great memory is when Elizabeth, Luke, and Marc were doing a puzzle in the living room. One of the pieces was missing. A search ensued. Marc dragged Elizabeth over the the lamp plug and traced the line to the light bulb. Yes, the light was off. Yes, more light would have been better. Elizabeth turned on the light and the hunt continued with the piece found. Marc was all smiles. Watch out for the quiet ones? Laura and Michael drove up from Connecticut on Saturday for a day visit with us. 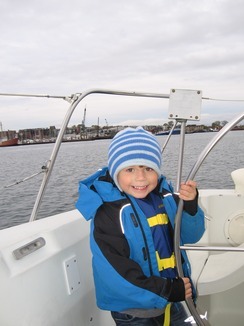 Beautiful day spent on the water aboard MELINA from Boston Sailing Center and at home. 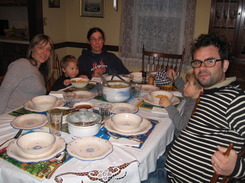 Elizabeth was on-duty so she stayed home and made green sauce and red sauce for pasta along with a pasta e fagiloi soup. Luke went along with the program and allowed his picture to be taken. Marc dodged the camera very cleverly. Next time we will get the little fellow in action.